pipage, pipe, piping, chimneypot, chimney, flue, fluke, trematode, chimney pot. 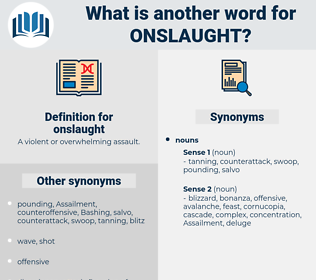 What is another word for onslaught? A violent or overwhelming assault. Narrows, attacking, strike, raid, avalanche, shock, onset, crackdown, encroachment, affront. 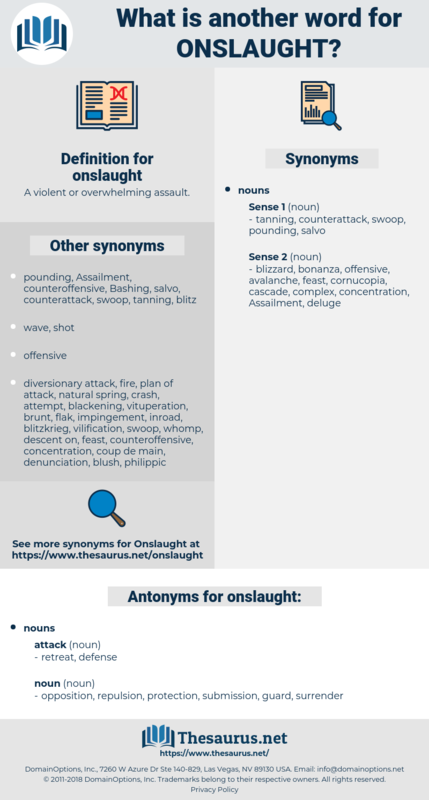 assault, attack, offensive, aggression, invasion, outpouring, massacre, Storming, slaughter, carnage, incursion, deluge, offense, campaign, spate, storm, flood. opposition, repulsion, protection, submission, guard, surrender. I planned to trick them, to throw them into confusion, and to cause a general panic by a sudden onslaught while they were resting and apparently finished for the day. Then the war came, with the Tuamasanga in an uproar from end to end, every young man being called to arms, and troops pouring in from Tutuila and the westward to join in the onslaught against Mataafa.